(Francisco Kjolseth | The Salt Lake Tribune) Utah Jazz center Ekpe Udoh speaks with the media on Wed., May 8, 2018. 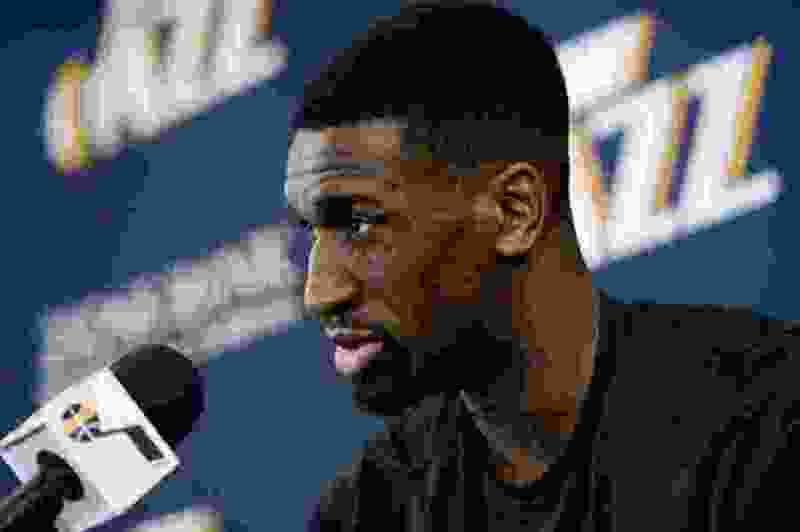 Utah Jazz center Ekpe Udoh tweeted late Thursday that he was looking for suggestions on what his popular, fan-based book club should read next. One woman suggested a John Grisham novel. A couple of guys jokingly responded with the Book of Mormon. And then Udoh narrowed it down to the three most popular answers: “The Autobiography of Malcolm X,” “Becoming” by former first lady Michelle Obama or “The Sun Does Shine” about an inmate living on death row. That’s when one of the authors weighed in. The unexpected endorsement quickly spread on Twitter with some suggesting that Obama come to Utah for one of the book club’s “Author’s Talk” sessions. Udoh responded, too. His group will read Malcolm X’s book first and then Obama’s. Members just finished Jazz owner Gail Miller’s “Courage to be You.” And the Jazz owner appeared at his book club to talk about her life. Udoh said Monday that he was surprised to see Obama’s response when he looked at his phone.